prowrestlingguerrilla.com • View topic - Avengers Assemble! Okay, so who has checked it out yet? Thoughts? I really liked it. A nice step up after the disappointing Iron Man 2 and Cap movies. I thought most of the characters were given a fair amount of time. I really enjoyed The Hulk. It doesn't hurt that Detective Toschi has assumed the green rage. Question, why did the Hulk turn grey for awhile in the comics? I liked how Tony was poking Banner and trying to get him to flip his lid. Loki was talking down to the Hulk and then the Hulk proceeded to smash up Loki like a rag doll. Loki was gasping for air as Hulk muttered "puny god." where Tony makes good on his shawarma promise and The Avengers are just sitting in this destroyed little restaurant was another nice humorous moment. grinning after the initial credits, right? I am sure more will come to me but all in all I had a great time. Now I am looking forward to Iron Man 3 under the direction of Shane Black! Oh yeah, it was also cool getting to see the latest TDKR trailer and Spidey trailers on the big screen. I think this latest installment of the Spidey series should age well. Excited about them both, more so the Dark Knight. First time I seen anyone say they were disspointed with Iron Man 2. That movie was awesome. I wish I could have seen this "awesome" movie. I just left utterly disappointed. I went with a group of six other people and never before have I left a movie where it was unanimously agreed upon by so many that what we just watched was utter rubbish. I saw it a second time just in case I over hyped myself before my first go around. It was just as bad the second time. Mickey Rourke on the surface is a more interesting villain than War Monger but is given nothing to do and is just one dimensional. Whiplash spends all his time tinkering with drones and jobs out in just a few minutes. Iron Man and War Machine easily defeat those drones. That was very anti-climatic. Iron Man just easily creates a new element to keep himself alive. How simple and convenient. They brush on Stark's alcohol problems in a campy way. War Machine and Iron Man have a goofy fight and Iron Man pisses himself. Yada, yada, yada the movie just did nothing for me. However, I am excited about the third installment. Sure the second one was a bump in the road but I remain optimistic about the third film due to Shane Black. Black directed Downey Jr in his true come back film, the glorious Kiss Kiss Bang Bang. Check it out. Black has the credentials for awesome original action sequences and fun snappy dialogue (Lethal Weapon 1 & 2, The Long Kiss Goodnight, The Last Boy Scout, and KKBB). Black is also directing. A good move on RDJ's part in enlisting the help of Shane Black. 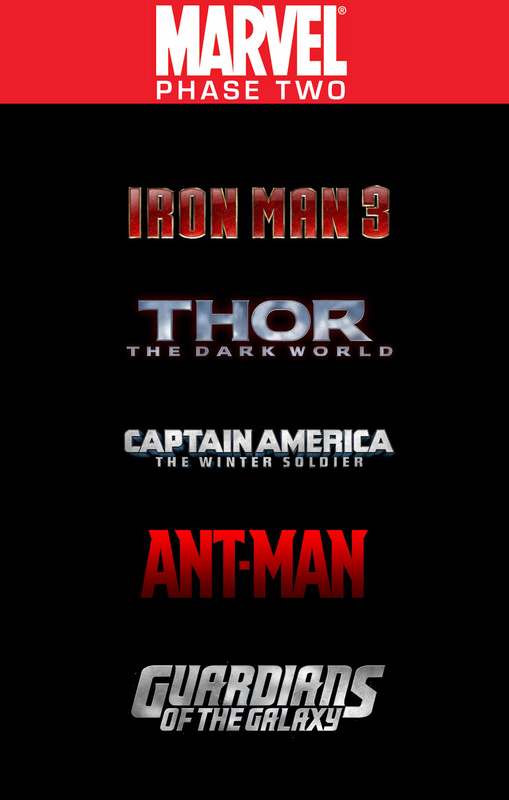 The Avengers was a festival of fun and I am sure Iron Man III will be a wonderful follow up. speaking of Iron Man 3, in a recent leaked picture, it was revealed that the Iron Patriot would appear, this was apparently denied but had it appeared, it was going to be someone else under the suit than in the comics, since in the comics, the Iron Patriot was Norman Osborne, aka the Green Goblin, and since Spider-man movie rights are owned by Sony and not Disney, there was no chance of any reference of Spider-man to appear in the Marvel Cinematic Universe, right? Does the set come in that IRS style briefcase with our very own Tesseract? When I initially heard Ant Man was in the works I was not very keen on the idea. I will give it a fair shake though know that Edgar Wright is involved. I would have preferred to see Cap fight during WWII or the Cold War rather than see him in our time. Iron Man 3 should be great, I am looking forward to that. I hope that this build for Phase 2 pays off like Avengers did. CheMateo wrote: Does the set come in that IRS style briefcase with our very own Tesseract?